Dr. Randy Smith, pastor of the Sebring, Florida, Grace Brethren Church, was one of the speakers for today’s “North of 55” Day Away for seniors at Wooster, Ohio. 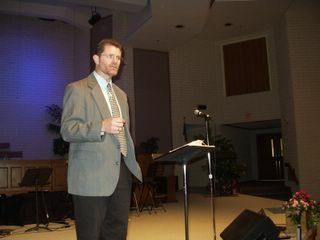 Other speakers included Pastor Dan Allan of Ashland, Ohio, and testimonies were given by Herb Carr and Ed Jackson. Ed Lewis was the emcee and Seniors Pastor George Johnson of the Wooster church chaired the host committee.